The Dbx DriveRack range has been a strong seller since it first appeared a few years back, and I remember trying out the original DriveRack PA and buying one in the same week, as it offered so much functionality for a very reasonable price. Since then I have owned and used the models that followed, namely the much‑improved second‑generation DriveRack PA+ and the DriveRack PX, which was designed specially for use with active speaker systems. The DriveRack PA did what its makers said it did, and represented a lot of processing in a small affordable 1U package, but without some of the flexibility of the more upmarket 'pro' DriveRack models. Now there's the DriveRack PA2, which is still in the affordable price bracket, but comes with an extended and more user‑friendly feature set, including network and Wi‑Fi control capabilities for iOS, Mac, Android, and Windows‑based devices. In simple terms, the DriveRack PA2 is something that sits between your mixer outputs and your power amp (or powered speaker) inputs, and it acts as a comprehensive speaker‑management system. To carry out this role it incorporates various functions including an active crossover, compressor/limiter, equaliser, feedback eliminator and more. All that it does, it does at a 'system level'; in other words it processes the main signal going to your rig (or monitors) and not individual elements within the mix, although you could use it on any insert point like any other piece of outboard kit. Although the functions within the PA2 can be used and controlled individually, one of the benefits of having an integrated one‑unit solution is that they can be set up together, and the PA2 incorporates a fully automatic Setup Wizard that guides the user through the whole process, and is designed to apply the processing needed to optimise a live‑sound setup quickly and easily, and without requiring any specialist knowledge of the functions involved. Even though the DriveRack PA2 is a somewhat simplified version of its upmarket siblings, it is still a powerful machine with many functions, including the ability to control many parameters from the front panel, and this new model has various updates and improvements to both its processing algorithms and to the user interface. Let's take a quick look at some of the main processor stages within the PA2, before getting on with how to drive it. There's not anywhere near enough room here to cover all the functions and features on offer, but if this review interests you, you can learn more about it by downloading the manual — and the wireless control app — from the Dbx web site. The DriveRack PA2 takes a two‑channel input and processes it into a one-, two- or three‑way stereo output (ie. it has two input sockets and six outputs). 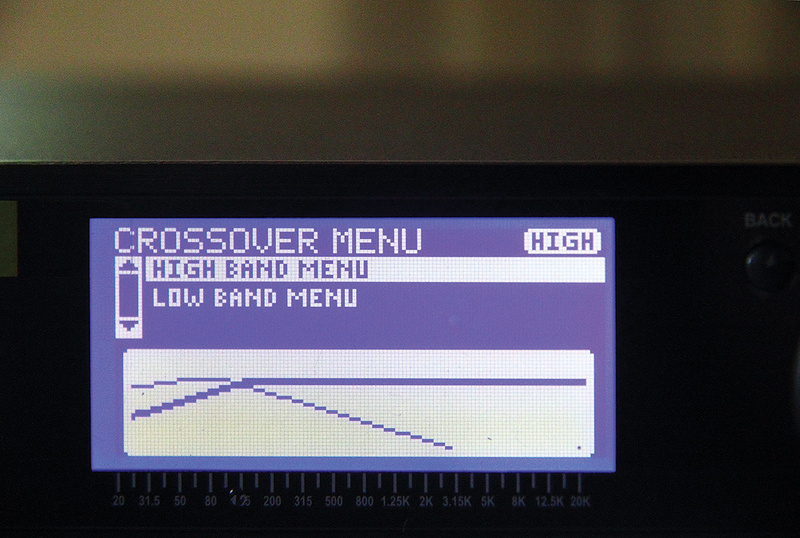 The crossover frequencies, filter types and slopes can all be adjusted, and the output levels of each band can be set relative to each other to suit the amps and speakers that it is feeding, using the front‑panel controls and nice clear graphics on the small LCD screen. The available filter types are Butterworth and Linkwitz‑Riley, which have different crossover characteristics (for example a Linkwitz Riley will commonly be chosen for crossovers as the upper and lower signals are attenuated by 6dB at the crossover point, which results in unity magnitude, (ie. a smooth flat overall transition), and although these will often be precisely specified by speaker manufacturers, they can be freely adjusted if desired. The rear panel houses all the analogue I/O (one stereo input plus three stereo outs), as well as the Ethernet port, which allows for remote control via an iPad when connected to a wireless router.The user manual has some useful information on setting up crossovers, and goes some way to explaining the audible difference between the two filter types. It's easy to set up the crossover filters manually, and what I like most about this function is the live LCD display, which shows the crossover curves changing as you adjust the parameters, which is a great way of understanding what is going on. The use of a crossover is rendered partly redundant by some self‑powered speaker systems (those that have their own high/low-pass filtering built in), but the ability to set different curves using the PA2 as an external processor can significantly improve system performance in some difficult venues. The PA2's limiter provides user control over threshold and the transfer curve's 'knee' characteristic, which is managed by applying different preset 'Overeasy' settings. The ratio is fixed at 'infinity to one', and there is an allowed transient overshoot of 3dB, so the output will deliver signals 3dB above your limiter threshold setting for very short periods — so if you really need to prevent any signal peaks, however brief, from exceeding a particular level then you'd set the threshold 3dB below this. The limiter circuit is not, as far as I'm aware, a 'brick wall' limiter like the PeakStopPlus design found in the higher‑end DriveRack models, and you can't alter the overshoot margin, but it's useful protection against accidentally over‑driving your system, so long as you bear in mind that the PA2 has no control over anything connected after it, so it can't protect your speakers against inappropriate amplifier settings. The PA2 has one limiter circuit for each output band (ie. it's post‑crossover), so it's possible to apply different settings to each band as dictated by the power amps and speakers. Applying post‑crossover limiting has the advantage that, as the different frequency bands are unlikely to reach the limiter threshold at the same time, part of the output signal will remain uncompressed by the limiter meaning that the sound won't all be squashed flat just because one band has reached the limiter threshold, so the gain reduction applied will tend to sound more natural and retain some of the programme dynamics. Whereas the limiter circuit is mainly there for protection, the PA2 also includes an overall compressor stage before the crossover, and although this affects the whole signal you do have more detailed control of the settings than is the case with the limiter circuit. Compression of a whole live mix needs to be approached carefully, but it does have its place, and is a useful tool for evening out recorded tracks and making the material sound subjectively louder. Again, the Overeasy setting controls the onset of compression, with higher preset numbers introducing a softer knee curve to give a less noticeable effect. The PA2 provides a comprehensive array of EQ options, which operate in a different way from the previous DriveRack PA model. There are five EQ stages available in total, four of which are eight‑band parametric types, with the fifth being a 31‑band graphic EQ. One of the parametric stages is applied to the input signal, and is initially set by the Auto‑EQ Wizard (though the eight bands can also be manually adjusted if needed). The other parametric EQs operate on the outputs (one per output), and are automatically set if the preset speaker tunings are applied using the Setup Wizard — but these, again, can be adjusted afterwards as necessary, and have, in any case, to be manually set if there is no appropriate preset tuning for the speakers being used. The graphic EQ is available as a fully manual stage on the PA2's input side, and contains 31 frequency bands from 20Hz to 20kHz, the gains for which can be adjusted in 1dB steps. Six preset curves are provided as starting points, including one called 'flat', which does what it says and is handy for cancelling everything out and starting over. The graphic EQ can be used to fine‑tune the sound, if necessary, after having run the input‑side parametric EQ in auto mode. The PA2 incorporates an automatic feedback suppressor (AFS), which can detect the onset of audio feedback at any particular frequency and then quickly apply a very sharp notch filter to attenuate it. There are 12 filters on tap, and each can operate in two ways — either as a fixed filter that, once set, remains in place until manually cleared, or as a dynamic filter, which is applied when feedback is detected during a live performance and has the option to automatically release after a predetermined time. Three filter widths are available per filter, from very narrow for music programme material to a wider 'speech' setting, which acts faster and is more aggressive in terms of what it removes from the overall content. The new feedback‑detection algorithm in the PA2 is claimed to be faster than in the old model, and it is also adaptive and will automatically widen the notch filter if a second feedback frequency is detected very close to another, thereby using one filter to take care of two problem frequencies, and leaving the other filters ready for deployment. When I tried it out it certainly worked quickly and smoothly, and on running it a second and third time with the same mic setup it picked up the same frequencies in the same order each time. I did try to trick it into assigning a filter on a keyboard note, but the algorithm worked as it should and my sustained note wasn't removed! One of the features I particularly like is how the PA2 displays the frequency, width and depth of the filters as it sets them, and you can display the current parameters of each filter by using the data selector wheel. One thing to watch out for is to not turn the data wheel immediately after ringing out the feedback, when the fixed filters are all set, without checking that it isn't still focused on the AFS on/off menu entry, or it will defeat the AFS — with possibly unpleasant consequences if the PA is turned up. The PA2 provides two delay stages: one is an overall delay, applied to the input signal, which is used for time‑aligning the front‑of‑house speaker output with sound coming from the back of the stage; the other is for individual driver alignment, when running bi‑amped or tri‑amped speakers, and compensates between output bands so that multiple speaker units can be optimised to work together, for example if the subs cannot for some reason be placed directly beneath or in line with the mid‑range and HF drivers. The post‑crossover alignment will normally be included within preset speaker tunings, and the input delay is definitely one process that benefits from the wireless app, as it can be adjusted remotely when listening to the system from the middle of the audience area. Without getting into all the detail of this, the good news is that input adjustments can be directly entered in distance (feet or meters) or time units (milliseconds), so you can simply measure the distance that you want to compensate for and dial it in. 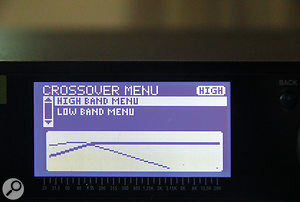 When adjusting the crossovers, a visual representation of their response curve is presented on the front‑panel screen.The real‑time analyser function is retained from the previous version, and although the Auto‑EQ mode now uses a frequency sweep signal, the PA2 still acts as a signal generator and can produce tones, and white and pink noise signals, for testing and monitoring. Whatever is coming out of the system speakers is picked up by a flat‑response measurement mic connected to the RTA input, and a 31‑band level‑versus‑frequency analysis is displayed on the screen and can be useful for investigating audible problems such as speaker polarity issues or for tuning the whole system manually. A key benefit of the PA2 is that setup can be carried out automatically, but I do like the fact that all the individual processing stages are available for stand-alone use by pressing a single button on the front panel. If the Setup Wizard's help is required you don't have to rub a lamp or incant anything, you simply press the big red illuminated button labelled 'Wizard' and all the magic is there at your command. Running through the Wizard routines is simple, and the step‑by‑step instructions and information displayed on the screen is clear and unambiguous, and in my view definitely better than the old DriveRack PA. All the main functions have been 'Wizardised', and when the red button is pressed a choice of options is presented in a scroll‑down menu; from here the AFS, Auto‑EQ/Level Assist and Setup (crossovers and so on) Wizards can be started directly. There is also a Wizard Options feature, which allows lower‑level preferences to be chosen within the scope of the Wizards. The most tempting choice is 'run all Wizards', which goes through the lot in the optimum order to set up all possible automated system parameters. The data wheel acts as an 'enter' or 'confirm' button, and all the text is easy to read even when it's highlighted. The screen has a decent angle of view, but is best read from directly in front. With automated systems there's always a fear that a 'computer says no' point will be reached, but the PA2 makes it easy to step back through pages and escape the menu or setup when desired, and the designers have obviously taken a lot of trouble to make operation as straightforward as reasonably possible given the range of functions and options on tap. From a practical angle, the PA2 couldn't really be easier to use — there is no on/off switch, and when the unit powers up all the output channels are muted, though this can be altered in the utility menu. I crossed my fingers and cut power to the unit whilst it was still connected to my monitors, and there was no pop or noise of any kind — a big improvement over the original. Ease of use and quick setup is a big feature of the PA2, and I think it's also a major step forward from the old model. Then, of course, there's the facility to access the functions via the wireless iOS app; with a router connected to the PA2, the remote control app answers one of the problems I've always had with the DriveRack units, and that's where to locate it. As a crossover and limiter it really needs to be in the amp rack or at least near the speaker system to avoid running multiple pairs of cables, but as a compressor or a feedback suppressor I'd prefer to control it from the mix position. Now the excellent app solves this, as the PA2 can be physically located to suit the cabling, and remotely controlled from wherever you like. The DriveRack PA2 has real differences and performance improvements over the previous model. It's a one‑box solution to most everyday live‑sound system setup issues, and can offer precise control via simple, automated routines or by detailed manual operation. It's hard to see how it could fail to offer some advantage, and its convenience and price make it worthy of serious consideration even for just one or two of its functions, let alone all the other clever stuff inside. Other similar units include the Mackie SP260, Peavey VSX26 and Alto Pro Stage Drive. Single, neat unit with a host of functionality. Very easy to use, especially with the Wizard functions. Allows a good level of manual control over individual processing. Remote control app allows operation from anywhere in the venue and has a great user interface. At this price, nothing springs to mind. A significant improvement over the original model, offering a wealth of features at a very accessible price.